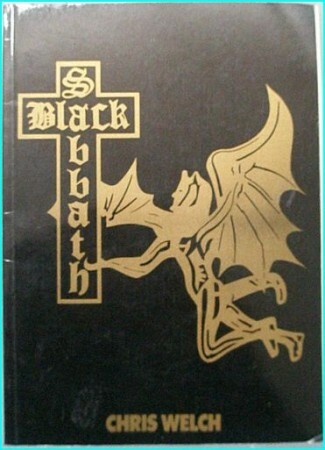 Home / Other Items / Books / BLACK SABBATH Chris Welch. Used BOOK. Has a black cover, which is different to the normal & was included on a box set of CDs! Original but used with pages out but none missing, Black Sabbath Chris Welch Proteus Book 1982. 96 page, profusely illustrated in color and b&w. With a discography. Has a black cover, which is different to the normal & was included on a box set of CDs! This is famed Melody Maker scribe and noted rock biographer Chris Welchs stab at immortalizing the heavy metal institution that was/is Black Sabbath. Filled with photographs, interviews, and too many great anecdotes of life in the trenches with Ozzy, Tony, Bill, Geezer and their successors, this surprisingly uncommon tome is a must for that die-hard Sabbath-worshiper in your life. 5.0 out of 5 stars Totally awesome book! I read this book years and years ago originally. Its an awesome book on Black Sabbath. It covers up to the Born Again tour with Ian Gillan, as thats about when it was written. If you can find this, get it. Its well worth it. When I read the book I really enjoyed it. It is based more on just facts! There are things that are mentioned that went on behind the scenes. I’m sure that it is the best book out on Sabbath. To me, I want more and it is not easy to top this book. But until someone writes another, this one will remain the best. I was backstage in 1992 and someone walked up to Tony and asked him to sign this book. I butted in and asked Tony (I was already talkin’ to him) if he had read this book? He replied,”I think so.” Then I said,”Its a great book.” And then he said,”I think I remember reading it, its alright” I told him that, I liked the story about his girlfriend giving him ex-lax and nailing the bathroom doors shut backstage.” He told me,”I seem to remember that, didn’t that happen to Ozzy.” So did this really happen? Or was Tony tryin’ to deny it? Was it too many years ago? Was it a blown up story?